Are you looking for ways to increase sales on your e-commerce store? Did you know that 54% of abandoning shoppers will purchase products left in shopping carts, if those products are offered at a lower price (RetailData). In this case study, discover how Crossrope.com grew their email list by 900% while at the same time recovering nearly 8% of abandoning visitors with a discount. 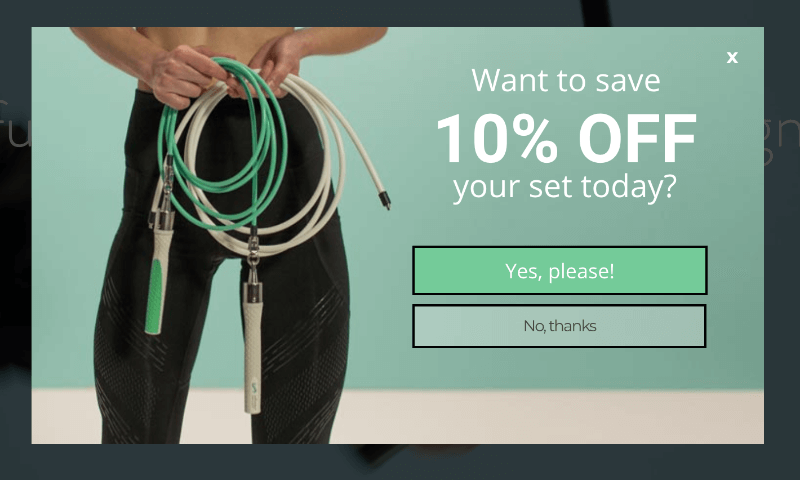 Crossrope helps busy people get fit and lose weight with their fun new jump rope experience. With their patented jump rope system, free training app, and large online community, they strive to inspire people to have fun with fitness again. Their goal, like many ecommerce brands, was to increase the number of qualified leads on their email list. Before using OptinMonster, they were collecting only 200 leads each month. They knew that increasing the size of their email list would have a direct effect on increased sales and got to work. Crossrope knew it wouldn’t be possible to dramatically grow their list without capturing visitors about to leave the site. Nearly 70% of visitors on any website will leave without taking an action! Anything they could do to recover even a small percentage of those visitors would prove a good investment of their time. Using our exit-intent trigger, Crossrope displays the lightbox optin below on almost every page of the site, just as the visitor’s mouse motions towards the browser bar. That’s a sure indication they’re about to hit the back button, or preparing to enter a different website’s URL in the bar. Clicking “Yes, please!” reveals the Optin view, which includes an optin form. Once the visitor completes the form, the coupon code is revealed. “No, thanks” simply closes the optin. It may seem counterintuitive to ask the visitor to first click a Yes button, and then complete the form. That’s a lot of extra clicks! Why not just show the optin form to start? This two step process takes advantage of an old psychology principle called the Zeigarnik Effect. This principle says when people start something, they’re more likely to finish it. The visitor who first clicks the YES button has already committed to the action behind it and is more likely to complete that action. This optin converts 7.65% of abandoning visitors. After seeing such success with the lightbox optin above, Crossrope moved on to using a similar technique on their blog. The fullscreen optin below displays on exit, asking the abandoning visitor who is leaving without taking any action, to instead TAKE ACTION by joining their 30-day challenge. Clicking “TAKE THE CHALLENGE” redirects the visitor to the Challenge landing page to register. Clicking “I’d Rather Not Exercise” closes the optin. This optin converts 13.71% of visitors. If you’re not quite sure how to build your campaign, or if there any uncertainties while setting up the display rules or integrations, make sure to contact the OptinMonster support team. Every question we’ve had was handled quickly and their support team is friendly, professional, and they absolutely know what they’re doing. We’re so proud of the results Crossrope is getting! Other OptinMonster customers have seen great results capturing abandoning visitors, too. Neil Strauss increased conversions 125% using exit-intent optins. Crossrope.com invested heavily into their abandoning visitors and it paid off. Crossrope.com converted 13.71% of abandoning visitors to active participants. Crossrope.com recovered 7.65% of abandoning shoppers. Crossrope.com increased subscribers by about 1800/month using OptinMonster. Don’t let your abandoning visitors go without a fight! Using OptinMonster’s exit-intent technology allowed Crossrope to capture more engaged leads than ever before. Utilizing OptinMonster’s improved campaign builder allowed us to create high performing campaigns without needing any design or development help. Before OptinMonster, we collected 200 new leads from our site per month. After, we collected 500 new leads a week, more than doubling our new lead conversion rate. Definitely worth the investment.